79 Types of Coffee (Definitive Guide) Drinks, Beans, Names, Roasts | EnjoyJava! Ready to expand your coffee knowledge and delight your taste buds? In this huge guide, you'll learn about 79 types of coffee. You'll find the most popular, types of coffee drinks, types of beans, types of coffee roasts, and their specific coffee names. Of course, we also include just what goes into each of these drinks that'll help you create these new flavors at home. Where Will Your Coffee Adventures Take You? Coffee is loved all around the world. In the United States, more than half of the population drink coffee. It's’ a popular breakfast drink that many think is necessary to begin their day. But, coffee is also a popular socializing drink. Professionals meet up at restaurants to discuss business over a cup of coffee. Many dates take place in cozy cafes over a cup of joe. 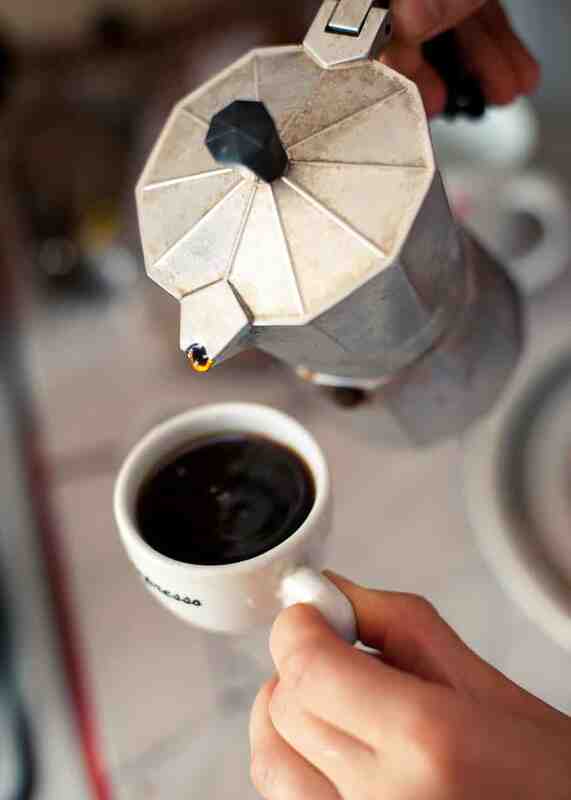 And, a fresh pot of coffee makes the experience of catching up with friends all the more warm and pleasurable. You may be used to your own particular style of coffee, so what happens when you walk into a coffee shop and see all those items on the menu that look like foreign words? I mean what really is an espresso? And what about a macchiato? What's the difference in coffee roasts, and how do you know which one is best? All those coffee drinks look appealing, but which one should you try? This article is your guide to all the different types of coffee drinks, coffee beans, coffee names, and coffee roasts out there. Hopefully, we'll answer your questions about coffee so that you'll want to start taste testing some new drinks at your favorite cafe, and brewing up some flavorful creations of your own. We’ll also let you in on some bizarre coffee preferences that just might help out with some interesting coffee table conversation. Let's start out by talking about some of the most popular ways to make coffee and the pros and cons of each. Most of the following methods are pretty easy. With a good coffee grinder and some basic gear you'll be ready to start trying new brew methods which will bring out those yummy flavor profiles in your coffee. Chances are, you’ve had drip coffee at some point in your life. You may have a drip coffee maker in your home or workplace, or you’ve used one in a hotel room. It’s one of the most popular methods of making coffee. The drip method brews coffee by heating water in a tank with heating rods. The hot water then slowly passes over ground coffee beans in a filter (usually paper) and then drips below into a glass carafe. When the process is finished, you have a collection of coffee grounds in the filter and a carafe of coffee that is kept hot by a hot plate. Drip units come in a wide variety of sizes and styles with prices ranging from cheap to expensive. You can choose one that fills only a single cup of coffee or one that provides enough brew for a party of people. It's easy, simple and fast. You can control the strength of the brew by how much water and grounds you use. Coffee grounds can’t be left to sit inside the filter too long or mold can grow. If the carafe remains on the hot plate too long, the coffee can develop a burnt taste. The French press was probably how your grandparents (or even great grandparents, depending on your age) made coffee. But, it’s still a popular method preferred by many today. Usually a low-cost item, the French press involves a glass or metal beaker that you fill with coarse coffee grounds. Next, add hot water and wait for the grounds to steep. Then, you press the accompanying plunger down to the bottom of the beaker and hold it until the grounds are separated from the coffee. Now, you’re ready to pour the brew into a cup. The thing about using a French press is that you need to play around with it a bit to figure out your preferred brew time. Many like it somewhere between 4 to 5 minutes, but you may discover that going a little under or over that works best for you. Once you figure that out you'll need to set a timer each time you use your french press. But, one sip of the resulting distinctive flavor is well worth it. Because you don’t use a filter with the French press, you get the full, natural robust flavor from the ground beans. You can control the brew time (and the taste). It requires little counter space and can be stored in a cupboard. It may leave coffee ground sediment at the bottom of your cup. If you want the perfect, smooth cup of coffee, cold brew is the way to go. With cold brew, you steep coarse coffee grounds in cool water for a long period of time, say from 12 to 24 hours. The Japanese began this method centuries ago, and you can easily make cold brew at home with just a French press, a mason jar, or an airtight cold brew maker. The idea of brewing coffee in cold water may seem unappealing, but the end result of this method is a strong, intense flavor with no bitterness. Because the coffee grounds aren’t heated, the acid level is very low, and bitter flavor notes are not a concern. Best of all, you get a super smooth aftertaste. The cold brew process produces a concentrated coffee which is usually diluted with water when served, this means there is often less caffeine in a cup of cold brew than a regular cup of coffee. Another bonus is that as long as you store your coffee properly (sealed to keep out other flavors) it will stay tasty for up to two weeks in the fridge. So all you need to do afterward is heat it up or blend it with ice and your choice of flavors. You get a unique, smooth taste without any bitterness. You can make enough to stay tasty for up to two weeks. It's easy on those who suffer from heartburn or acid reflux. It requires patience to let the coffee brew several hours. If you always drink your coffee hot you may not like having to heat up your cold brew. Pour over is a classic tried and true method for making coffee, it basically involves slowly pouring hot water over coffee grounds in a filter through a cone or upper chamber. The brewed coffee is then collected in a lower chamber. You’ll find a wide variety of pour over devices that range from plastic to glass, ceramic to stainless steel. Some affordable models look like simple hourglass flasks while more expensive ones include fancy accessories, but the Chemex, Hario V60, and Kalita Wave are some of the most popular models. Most pour over devices use thick, bonded filters which cause the coffee to drip at a slow pace. This means you get a richer tasting cup of coffee. To get your coffee as you want it, the pour-over method requires you to be involved in the whole process and to experiment with brewing times. But, once you find your sweet spot, you may never want to change methods again. It produces a smooth, flavorful cup of coffee. You’re in control of brewing time to acquire your desired strength and taste. It's not ideal for those who prefer to push a button while still half asleep in the morning. It requires some patience and practice. Boiled Coffee: Brewing coffee by boiling it with water is among the oldest and most basic types of coffee making. All you need is coffee grounds and a way to boil water. That’s it. Here are a couple of traditional, boiling types of coffee that have stood the test of time: Cowboy and Turkish coffee. 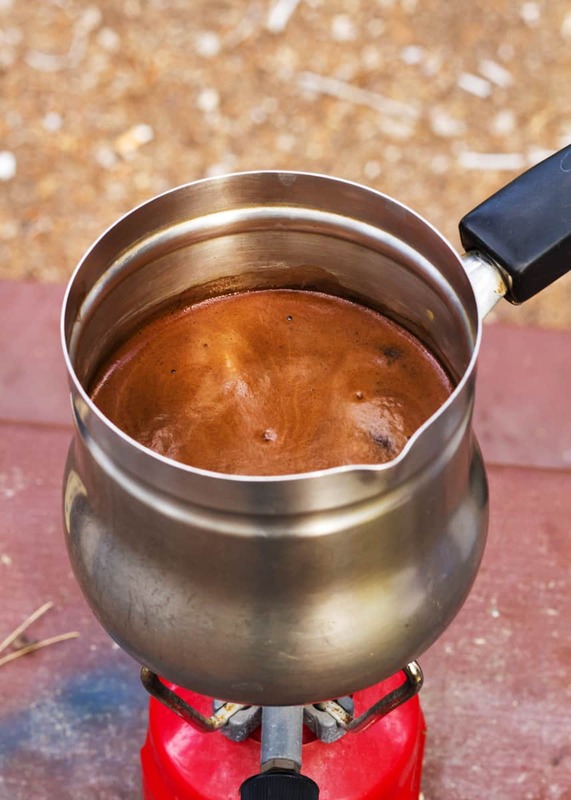 If your coffee maker suddenly dies, or if you’re craving coffee while camping out in the wilderness, the old-fashioned cowboy method will at least keep you from going through coffee withdrawal. 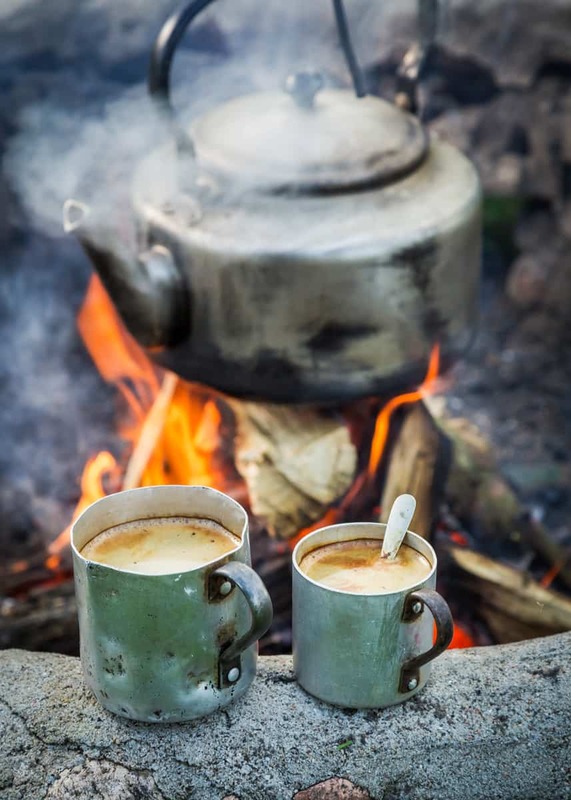 All you need is a saucepan or tin coffee pot and a campfire (or stovetop). Put your desired amount of water in your saucepan and bring it to a boil. Stir in your coffee grounds (one scoop per each cup) and then remove from heat to allow the coffee to brew for a few minutes. After the grounds settle to the bottom of the pan, you can slowly pour the coffee into a mug and drink. The resulting brew depends a bit on your brewing time, 4 to 5 minutes should do it. If you don’t get it just right, your coffee could taste too bitter or too weak, but you can tweak it each time you make it until you get it just right. Helpful tip: Pouring a little cold water on top of the coffee once it's finished brewing can help the floating grounds sink to the bottom. It’s easy and requires little equipment and skill. You can use it just about anywhere. It may not be the best coffee you’ve ever tasted. You may get coffee grounds in your cup unless you have something to strain your brew. There’s a chance you’ll burn yourself or the coffee. A traditional coffee drink in the Middle East, Turkish coffee is boiled on the stovetop in a special, wide-bottomed coffee pot called a “cezve.” Turkish coffee is known for its frothy foam that is formed by boiling water and powdery-fine coffee grounds. This type of coffee is for those who love strong, black coffee. A Turkish made copper pot like this one will help you make this specialty coffee at home. The way it works is you slowly bring the coffee grounds and water to a boil, watching as it builds a dark foam on top. Just before boiling, you scoop off some of the foam into your coffee cup. After the coffee boils, you pour half of it onto the foam in your cup. Continue boiling the remaining coffee for about 15 to 20 seconds and then use it to fill up your cup. It requires your undivided attention. If you don’t watch the pot closely, your coffee could boil over and burn. Also considered one of the boiled types of coffee, percolated coffee was very popular before drip coffee stole the show in the mid-1970s. Percolated coffee is brewed in a stove-top or electric stand-alone unit. Boiling (or nearly boiling) water is continuously cycled through the grounds until the desired strength is achieved, usually for around 7 or 8 minutes. Because the brew is boiled multiple times, it tends to over-extract from the grounds and results in a bitter coffee. If bitter coffee is your thing, this is a great method. It’s really aromatic and makes your home smell nice. It produces a bitter taste. The percolator must be cleaned frequently. If you’re a DIY coffee lover, you may appreciate infused coffee. French press coffee (talked about earlier on this list) is often referred to as an infusion method but in this section we're talking about using an infuser to make coffee. This method is similar to steeping tea. You simply put coarse coffee grounds inside an infuser that is placed inside a carafe. Add hot water and let the brewing magic begin. Paper filters aren’t involved to absorb the oils from the coffee grounds, so you get the full flavor effect. Another great thing about the infusion method is that it gives you control over the brew time. Whether you like it mellow or strong, you can tweak your brew time to provide you with the perfect cup of coffee every time. With the infusion method, you can keep it simple with an affordable hands-on gadget. You have control over steeping time. You can watch the brewing process. Stray coffee grounds may occasionally escape into the coffee. Water must first be heated before adding it to the infuser (unless it’s an electric one). First created in the early 1800s, a vacuum coffee maker involves a complex system of glass flasks and siphon tubes that look more like a chemistry lab. It uses a combination of full water immersion and siphon action to produce what fans swear is a pure, clean and delicious taste. This method requires an enormous amount of practice, effort and time, so it’s not something you can just throw together in the morning before work. You’ll need to gauge the water temperature and know just the right time to turn on the vacuum. But, if you enjoy the art of making coffee or impressing your friends, you may enjoy the vacuum coffee method. You have control of vacuum time and brewing process to achieve optimal taste. It looks impressive to your friends. Setup takes time, so it’s not a quick coffee-making method. The vacuum pot system may be difficult and tedious to clean. It requires practice and patience to get your preferred brew just right. If you want an affordable, portable coffee maker that produces a texture similar to espresso, the moka pot may just be the thing for you. An Italian invention from the 1930s, the moka pot is an electric or stove-top pot that brews coffee by passing water through ground coffee by pressurized steam. Bialetti makes a great moka pot in 5 sizes (1, 3, 6, 9, and 12 cup capacity). While the moka pot is sometimes called a stovetop espresso maker, it doesn’t exactly match true espresso results. But, the moka pot does offer you the bittersweet/strong concentration that gives you that energy kick of a true espresso. So, if you can’t afford an espresso machine, the moka pot is the next-best thing. Favored by many people for its concentrated brew and jolt of caffeine, espresso is brewed in an espresso machine. The espresso machine uses high pressure to force a small amount of hot water through a “puck” of finely ground coffee with quick speed. The result is a thick brew that's full of rich flavor and topped with a creamy foam (called crema). Warning: Espresso is one of those types of coffee drinks that can easily become an addiction :). It delivers a flavorful caffeine jolt that gets you through the day. It requires a hefty machine that is tedious to clean and takes up counter space. Espresso is the base for numerous types of coffee drinks that you are probably familiar with, let's talk about some of them now. As we look at how these types of coffee drinks are made it's good to remember that different baristas can use different milk ratios, so your cappuccino from one cafe may not be exactly the same as your cappuccino from another. Cappuccino: 1/3 espresso with 1/3 steamed milk foam and 1/3 hot milk. Flat White: 2/3 steamed milk and 1/3 espresso. Antoccino: A single shot of espresso made with steamed milk in a 1:1 ratio. Macchiato: An espresso shot with a small amount of steamed/foamed milk (only about 2 teaspoons). Cafe Bombon: Created in Spain, this espresso drink is made with sweetened condensed milk in a 1:1 ratio. Caffe Gommosa: A single espresso shot that's poured over a single marshmallow. Cortado: An espresso shot served with an equal amount of steamed milk to reduce the level of acidity. Latte: Made with 2/3 espresso 1/3 steamed milk and a thin layer of milk foam. Galao: A Portuguese drink made with espresso and foamed milk served in a tall glass. Caffe Americano: An espresso drink where hot water is added on top of a single or double shot of espresso. This produces a coffee drink that is similar in strength (but different in taste) to regular drip coffee. Long Black: Usually a 6-ounce drink that is an inverted form of the Americano, meaning the espresso is added on top of hot water instead of the other way around. Cafe Cubano: Originally from Cuba, as the name suggests, this espresso drink is made with demerara sugar. Cafe Zorro: A double shot of espresso (60 ml) added to water with a 1:1 ratio. Doppio: A double shot of espresso that’s served in a demitasse cup ( a small, single-serve cup). Espresso Romano: A shot of espresso with a slice of lemon on the side. Guillermo: Two shots of espresso poured over lime slices or ice. Ristretto: An espresso made with the same amount of coffee as a normal espresso shot but only half the amount of water, resulting in a concentrated shot. The following coffee drinks have a regular cup of coffee as their base and may or may not have added espresso. Cafe au lait: “Coffee with milk” is a combination of strong coffee and steamed milk in a 1:1 ratio. Coffee with Espresso: Also called a “shot in the dark,” or an “eye opener” this drink is where espresso is combined with regular coffee to either increase flavor intensity or caffeine content. Black Eye: A regular cup of coffee with two shots of espresso. Dead eye: A regular coffee with three shots of espresso. Botz: Literally meaning “mud,” botz is one of the most common types of coffee in Israel. It consists of pouring boiling hot water over finely ground Turkish coffee and allowing the drink to cool and the grounds to settle on the bottom. Usually served with sugar and cardamom. Nitro Coffee: Coffee infused with nitrogen. This cold brew coffee drink is rich and foamy, it has a naturally sweet flavor (thanks to the tiny bubbles) without added sugar. Bulletproof Coffee: This coffee is contains unsalted grass-fed butter and “Brain Octane Oil” (100% caprylic acid triglyceride from highly refined coconut oil). It's blended to have a consistency similar to a foamy latte. There are many drink combinations of coffee and tea around the world. Black tie: A drink made by combining a double shot of espresso (or strong coffee) with traditional Thai iced tea (a mixture of black tea, spices and condensed milk or cream). Red tie: A drink made like the black tie but with a single shot of espresso rather than a double shot. Dirty chai latte: A drink combining a regular caffè latte with chai spiced tea. Yuenyeung (drink): A popular drink in Hong Kong made by combining coffee and Hong Kong-style milk tea. Bailey's Irish Cream and Coffee: Served in a clear liqueur coffee glass, this drink is a combination of coffee and a shot of Baileys Irish Cream liqueur (25 ml) with a whipped cream topping. Rüdesheimer Kaffee: Deriving from Rüdesheim, Germany, this drink is made with coffee, sugar and Asbach Uralt brandy, and topped with whipped cream. Pharisee: Served in a mug, this popular drink from north frisian Island in Nordstrand, Germany is made with black coffee, a double shot of rum, and whipped cream topping. Barraquito: A traditional drink from Tenerife (Canary Islands), mixing Licor 43 with espresso, foamed milk, condensed sweetened milk, cinnamon and lemon. Carajillo: A Spanish drink that combines coffee with either rum, whiskey, brandy or anisette. There is an American version that serves this coffee/alcohol combination in a sugar-rimmed mug that is flamed to caramelize the sugar and then topped with whipped cream. Irish coffee: A drink combining coffee, whiskey, cream and sometimes sugar. Check out these types of espresso/coffee drink flavors and see which ones you recognize. Melya: A coffee drink flavored with honey and cocoa powder (sometimes cream as well). Espressino: Espresso made with steamed milk and cocoa powder. Some people also line their glass with Nutella before adding the cocoa powder, espresso, and steamed milk. Caffè Marocchino: Similar to espressino, this drink is made with espresso, cocoa powder, and milk froth. Café miel: Deriving from the French word for honey (“miel”), this coffee drink consists of steamed milk, cinnamon, nutmeg, vanilla and honey. Mocha or Mocaccino (Mochaccino): A double shot of espresso (60ml) served with steamed milk and hot chocolate (or chocolate syrup or cocoa powder) in a cappuccino cup and topped with whipped cream. Cafe Borgia: A mocha served with orange rind (sometimes orange flavoring) and topped with whipped cream and cinnamon. Café de olla: A traditional Latin American coffee drink prepared in earthen clay pots and flavored with piloncillo (also called panela – unrefined whole cane sugar) and cinnamon. Café Rápido y Sucio (or Quick and Dirty Coffee): A drink consisting of three shots of espresso and chocolate syrup only (no water or milk). Coffee with a flavor shot: Various flavored syrups are often added to coffee such as French vanilla, hazelnut, Irish Cream (non-alcoholic), caramel, and chocolate. Affogato: Also served as a dessert, this Italian drink features a scoop of ice cream (or gelato) with a shot of espresso poured on top. Occasionally, the espresso may be mixed with liqueur. You can also get a white affogato which is a regular affogato with milk added. Caffè Medici: This coffee drink has an Italian name but originated in a historic Seattle coffeehouse. The Caffè Medici is a doppio (double shot of espresso in a single-serve cup) that’s poured over an orange peel and chocolate syrup and topped with whipped cream. Egg coffee: This Vietnamese drink is made with robusta coffee, sugar, condensed milk and egg yolk. Kopi susu: A combination drink of coffee and sweetened condensed milk that is allowed to cool while the grounds settle to the bottom. Vienna Coffee: A coffee drink made with regular coffee or espresso with thick cream or whipped cream added and dusted with cocoa. We often think of coffee as a hot drink, but there are many delicious types of coffee that come in chilled form. Iced coffee doesn’t mean it’s cold brewed. Instead, it’s made using a hot brew method and then chilled before serving. It's easy to make iced coffee at home, once you read some of these options you'll probably want to start trying them out. Iced lattes and iced mochas: Popular types of coffee drinks that are combined with cold milk rather than steamed milk as in the case of regular lattes and mochas. Ca phe sua da: Originating from Vietnam and literally meaning “iced milk coffee,” this drink is made by combining black coffee with sweetened condensed milk and then poured over ice. Eiskaffee: This German coffee drink is made with iced coffee and vanilla ice cream. Frappé: Originated in Greece, a frappe is a popular iced coffee drink that has been blended, beaten or shaken to a frothy consistency and served cold with whipped cream and other additives such as milk, vanilla, sugar, and syrups (like caramel or chocolate). Freddo Espresso: Popular in Greece during the hot summers, this iced coffee drink is made with two shots of espresso and sugar. The espresso is put in a shaker with a few ice cubes and mixed for around 20 seconds. The coffee is then poured over ice which cools the drink and dilutes the bitterness. It's a foamy drink. Freddo Cappuccino: Also popular in Greece, this drink is made like the freddo espresso but with cold milk foam added to the top. Mazagran: Originating in Algeria, the mazagran consists of coffee and ice served in a tall glass. Sometimes, sugar, mint, lemon, water or rum are added to the drink. Palazzo: Popular in Southern California, the Palazzo is made with two shots of espresso. Right after the coffee is brewed, it’s chilled and mixed with sweetened cream. Ice Shot: Originating in Australia, the Ice Shot involves a single shot of espresso poured over ice in a regular latté glass. The hot coffee is diluted by the ice and is then refrozen to a slushy texture. Shakerato: Similar to the freddo espresso, this Italian iced coffee drink is where fresh espresso (one shot) and ice cubes are shaken together creating a froth. The shaken espresso is then served in a martini glass. Next up we talk about instant and decaf coffee then we'll look at a few other interesting types of coffee drinks that you may not have heard about. Please let us know if you've tried any by leaving us a comment, and if you've heard of others we haven't listed here. Instant coffee is made from ground coffee beans that have already been brewed. There are various processes that different manufacturers use, but essentially, the coffee is dehydrated into powder or granules that can later be rehydrated with hot or cold water (iced coffee) for an “instant” cup of coffee. There are some coffee brands that make instant coffee in a concentrated liquid form. Decaffeinated coffee (also called decaf) is coffee that contains little or no caffeine (97% to 99.9% caffeine-free). Many people love the taste of coffee but don’t want the caffeine content. While there are some positive points of drinking coffee with caffeine, like keeping you alert, there are some health concerns that could be related to the over-consumption of caffeine such as nervousness and a fast heartbeat. There are a variety of techniques involved in removing caffeine from coffee. Most of these methods include soaking the coffee beans in water and/or passing the beans through a solvent that dissolves the caffeine. Canned Coffee: While ground coffee is often sold in large cans, this canned coffee means coffee that is brewed and ready to drink. Widely popular in Japan (and other countries), canned coffee is sold in supermarkets, convenience stores and vending machines. Coffee Milk: Coffee milk is sort of like manufactured chocolate syrup that you buy to add to your milk to make chocolate milk. Instead of chocolate syrup, coffee milk is made by adding a manufactured sweetened coffee concentrate (called coffee syrup) to milk. South Indian Coffee: Also known as Indian filter coffee, Mysore filter coffee, or Kaapi. This sweet, milky coffee drink is common in South India and made from dark roasted coffee beans. Pocillo: Widely served in Latin American countries as an after-dinner coffee, the pocillo is most often meant to describe “a little bit of coffee” or coffee served in a smaller-than-usual coffee cup. It can involve all types of coffee drinks but is often a shot or small amount of unsweetened coffee made using a moka pot or espresso machine. A good cup of coffee isn’t just about how you brew it. It actually begins with which coffee beans are used. Did you know that coffee beans are not really beans at all in the sense that we normally think of beans? Coffee beans are actually the seeds from the fruit of coffee plants that are often called cherries. Bean variety (See the various types of coffee beans below). You’re probably familiar with Arabica coffee beans. Due to its sweet, mild taste and delightful aroma, it’s among the most esteemed types of coffee beans in the world, comprising between 60% and 70% of the world’s coffee production. Arabica is considered the “original coffee bean” because it’s derived from the first coffee trees that were cultivated in Ethiopia during the 9th century. Although it originated in the Middle East, Arabica coffee is today grown in many areas, especially in Colombia. Arabica is more expensive to grow than other types of coffee beans because it’s finicky about its growing conditions. It prefers high altitudes, mild temperatures and rich soil. This bean type is also prone to disease, so it requires extra tender loving care and attention. Compared to Arabica, Robusta coffee is considered inferior due to its strong, bitter taste that’s also described as harsh and earthy. It also contains twice the amount of caffeine as its rival. Grown mostly in Africa and Southeast Asia, Robusta only accounts for about 30% to 40% of the world’s coffee market, and much of that is used in coffee blends and instant coffee. However, the good thing about Robusta is that it’s a hearty plant that’s resistant to diseases and parasites and can withstand warmer climates. Good quality robusta adds a nice crema to a great espresso shot. Liberica accounts for just a small minority of the world’s coffee but can probably be considered the third most popular. It is native to western and central Africa but is also grown in Central and South America and the Philippines where it is most popular in a blend called Barako. Very bold and aromatic, it features a strong and fruity taste. Contributing to only about 7% of the world’s coffee production, Excelsa is sometimes considered a sub-species of Liberica, but fans of it prefer to keep it separate. It’s often used in house blends of Arabica and Robusta and boasts a distinct flavor that reminds you of tart fruit. The taste of your coffee is determined not only by the type of coffee beans that are used but also by the way they are roasted. Roasting is a heating process that transforms green coffee beans into the brown, aromatic beans we love to smell when brewing our favorite morning cup of coffee. The longer coffee beans roast, the darker in color they become and the more flavor and aroma is released. On the other hand, the longer the roast, the less caffeine and acidity they contain. Coffee bean roasts are categorized by levels of light, medium, medium-dark, and dark which are described in more detail below. If you don’t like strong coffee, a light roast may be more to your liking. Light roast coffee beans are roasted the least amount of time compared to other roasts. As a result, the coffee isn't oily on the surface and is lighter brown in color which is why it’s sometimes called cinnamon roast. The shorter roasting time also means more acidity and caffeine content but less aroma. This makes for a thin, mild cup of coffee. If you like coffee with fragrant and fruity flavors, you’ll find it among the light roasted coffees. Medium brown in color with more of a balance of acidity, flavor and aroma, medium roasted coffee also has a richer consistency then light roast. It also doesn't have the oily surface you'll see in the darker roasts. It is the most popular roast in the United States. If you want to kick your coffee up a notch in body and flavor, the medium-dark roasted coffee beans offer a bold body and rich flavor with a slight bittersweet aftertaste. 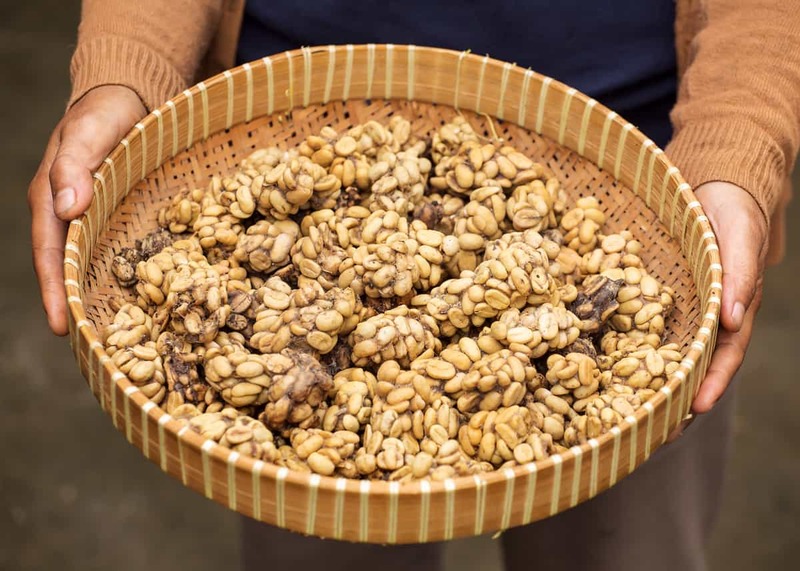 These beans are darker in color because they are roasted longer and feature a semi-oily surface, decreased acidity, thicker consistency and deeper aroma. If you’re a fan of espresso and Starbucks coffee, you most likely enjoy dark coffee roast. These coffee beans are roasted the longest of all the bean roasts until they are the color of dark chocolate or even black. The long roast time brings out the bean’s oil which you can see in the brew and produces a strong, sometimes bitter taste. Dark roasts feature an extra bold body and heavy mouthfeel that is preferred by many coffee lovers, especially those in Europe. Have you ever heard of cat poop coffee? What about Jacu bird coffee or Black Ivory Coffee? Check out these strange specialty coffees. Kopi Luwak Coffee, (Civet coffee in North America) is more informally called cat poop coffee. Sounds gross, doesn’t it? Well, here’s a forewarning for you: the process of making this coffee may sound even worse to you, but many people swear by its incredible flavor. This coffee is named after the Asian palm civet, a furry, nocturnal animal that’s native to Southeast Asia and Sub-Saharan Africa. It’s about the size of a cat but is more closely related to a weasel or mongoose. The civet loves to eat fruit such as mangoes, rambutan, and yes, coffee cherries. After the civet eats the coffee cherries, they ferment in the animal’s digestive tract and are then pooped out whole within about 24 hours. These civet droppings are then collected and the coffee beans are extracted, washed, and roasted to then be brewed into one of the world’s most expensive types of coffee. A cup of civet coffee can you cost you between $35 and $80 in the United States. If you want to purchase a bag of it, it could cost you up to $500. You might be asking, why the high price? The answer is because civet coffee is in limited supply. The most superior civet coffee derives from wild civets, and it can be difficult to follow these animals around to collect their droppings. So, civet-raising farms have developed to keep up with the demand. However, there are concerns about how well these animals are treated on the farms. You also might be wondering, why would anyone want to drink animal poop coffee? Those who love it say it tastes better than any other types of coffee. It could also be because many people like to try strange and daring things while others enjoy the expensive bragging rights that come along with it. But, if you think civet poop coffee is bizarre, it’s not the only animal poop coffee in the world. It appears to be a trend that is catching on. Check out the following coffees made by the poop of the Jacu bird and the Asian elephant. The Jacu bird is a native bird to Brazil, and like the civet, it feeds on ripe coffee cherries. On a small coffee plantation in Pedra Azul, Espirito Santo, workers collect the bird’s droppings and transport them to areas where they are then cleaned, dried and stored before processing. Fans of this unique coffee say that it’s end result is a full-bodied, sweet coffee that has a hint of cinnamon and a smooth, clean aftertaste. Black Ivory Coffee is a brand of coffee that is produced at the Golden Triangle Asian Elephant Foundation refuge in Chiang Saen, Thailand. Can you guess how it’s made? Yes, elephant poop is the correct answer. The refuge cares for about 20 rescued elephants and part of their diet is Arabica coffee beans. The beans take between 15 and 70 hours to digest before they can be collected and processed. The presence of the other ingredients in the elephants’ stomachs supposedly contributes to the unique, smooth flavor of Black Ivory Coffee. You’ll probably have to travel to get a cup of this specialty coffee at a luxury hotel, but the good news is that a portion of the sales is used to provide for the upkeep and health care of the elephants that reside at the refuge. So are you craving coffee yet? I know I am. It's such a versatile drink, there's no end to the possible flavor combinations. It seems both an art and a science with its own extensive culture of terms, methods, and processing. Which is awesome for coffee lovers who love to experiment and explore the wonderful world of coffee. Has this guide made you want to try different brewing methods, or any different coffee drinks? That Freddo Espresso is sounding pretty good right now! I haven't tried Turkish coffee yet either, so I've got that on the brain – it looks fun and delicious. Did you learn anything new about coffee from this guide? Is there anything you would like to see included? Would you try the civet coffee? Let us know your thoughts in the comments!